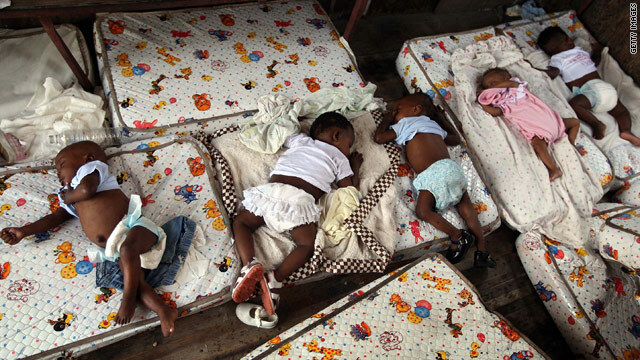 Haitian orphans rest on mattresses in a truck this week at the Maison des Enfants de Dieu orphanage in Port-au-Prince. London, England (CNN) -- Three aid groups called Thursday for an immediate halt to any new adoptions of Haitian children after last week's earthquake. Save the Children, World Vision and a unit of the British Red Cross said the focus first must be on tracing any family members that children may still have and reuniting them. "Any hasty new adoptions would risk permanently breaking up families, causing long-term damage to already vulnerable children, and could distract from aid efforts in Haiti," the agencies said in a joint statement. The disaster in Haiti has led to an outpouring of support around the world, with the United States alone donating more than $305 million as of Wednesday, according to the Chronicle of Philanthropy, a newspaper covering nonprofit organizations. Video: Haitian orphans moved to U.S. Stories of Haitian orphanages struggling after the quake and the plight of the children there also has led many to ask about adopting children. After reading a CNN report on Haitian orphans, CNN.com reader Dana Fanning wrote, "It broke my heart. My husband and our 4 children want to know if and how we could adopt [any] of the children orphaned by the earthquake." Save the Children Chief Executive Jasmine Whitbread said the "vast majority" of children on their own in Haiti are not orphans, but were simply separated from their families in the chaos. Their family members may still be alive, she said, and "will be desperate to be reunited with them." "Taking children out of the country would permanently separate thousands of children from their families -- a separation that would compound the acute trauma they are already suffering and inflict long-term damage on their chances of recovery," Whitbread said. Allowing a flood of new adoptions also could open the door to traffickers, said World Vision Chief Executive Justin Byworth. The poverty in Haiti already makes children there "extremely vulnerable" to exploitation and abuse, Byworth said. "We are concerned not only about premature overseas adoption but also about children increasingly being sent unaccompanied to the Dominican Republic," he said. Aid groups said adoptions that were already in progress before the January 12 earthquake should go ahead, as long as the right legal documents are in place and they meet Haitian and international law. For those who want to help Haitian children, Whitbread said, they should donate to aid agencies who are working on reuniting those children with their families. The International Committee of the Red Cross has opened an office at the headquarters of the Haitian Red Cross in Crois de Prez to help people locate their relatives, said Pete Garratt, a disaster response manager at the British Red Cross. The ICRC also has set up a Web site to help people searching for relatives, he said.